Portrait of Arthur Phillip, Francis Wheatley, 1786, National Portrait Gallery UK. Special thanks to Matthew Brenckle, former historian for the USS Constitution Museum, for pointing out this piece and connecting the dots to Jacob Nagle for me. 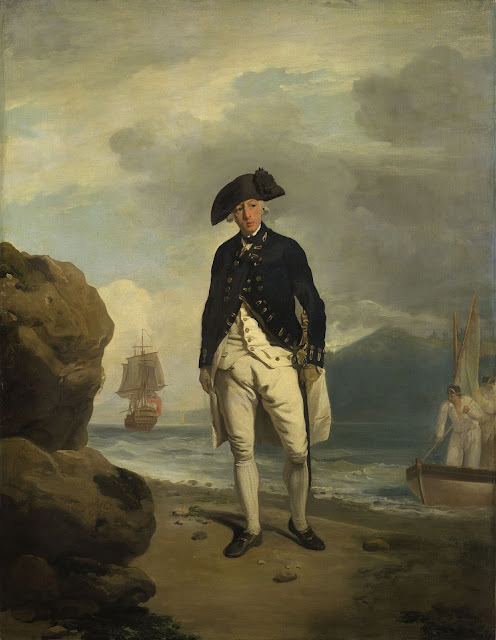 An experienced officer, Arthur Phillip is today remembered as commander of the First Fleet. This portrait was painted the year before his fateful voyage, and depicts him stepping ashore from his personal barge. A very similar scene may have transpired when he arrived on the shores of New South Wales, where he would soon be made governor. Phillip's flagship was the small ten gun Sirius. Thankfully for historians, one of the common sailors aboard the Sirius was Jacob Nagle, who is one of very few such men to leave us a primary source account of his experiences. In the morning when I awoke, the Governors barges cap that I wore was gone, my hankerchief off my neck, and what money I had about me was gone. The cap was silver mounted, with a large silver plate in the front with the Portegee coat of arms stamp'd on it, with Portegees letters or charictors on it. Commodore Phillip had served as a captain in the Portuguese navy in 1774, commanding the Nossa Senhora do Pilar in transporting convict labor. During the voyage, he sailed into a storm and survived only with the assistance of the convicts. It was for this reason that he was selected to command the First Fleet over a decade later. Apparently, Phillip held the experience close to his heart, as Nagle indicates that he still outfitted his bargemen in the caps of his Portuguese service. It is possible that one of these two men is Jacob Nagle himself. Certainly this is the uniform he would have worn when working the barge. Like many bargemen, it is remarkably simple: white shirt without waistcoat or jacket, plain trousers, and a black barge cap trimmed in white with a silver seal affixed to its front.